Click on the name of your budget in the top-left corner of the app. Don't worry—a copy of your current (now old!) budget will be archived with today's date in the name, which you can reference anytime by choosing Open Budget in that same menu. Even your Direct Import connections will be brought into the new budget for you. Your history of transaction and budget data will be cleared out—so you can start fresh! All you need to do is add your account balances as of today, and you'll be ready to start budgeting. If you use a bookmarked link to access your budget, be sure to update that too. 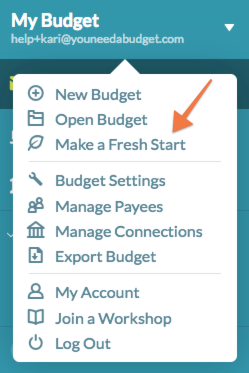 Once you've created your Fresh Start budget, if you're using one of the YNAB mobile apps, you'll need to switch budgets. In the YNAB mobile app, tap the gear icon to access Settings. Choose Open Budget from the menu. Select your Fresh Start budget—in the Available for Download list. Tip: Settings is also where you can initiate making a Fresh Start on mobile.